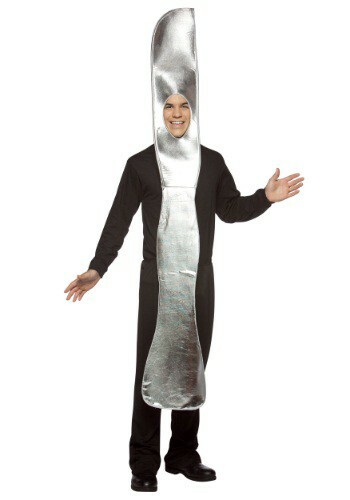 Don't bring a knife to a gun fight, unless it's this awesome Adult Knife Costume! Everyone will love it! What's not to like? It's shiny and over-sized, it could be hilarious or horrifying (depending how you wear it), and did we mention it's, like, SUPER shiny! This costume could defuse that whole gunfight situation with a few laughs in no time. You could act like an eating utensil from a fairytale! Suddenly brought to life and living in a cursed castle with hopes that a beautiful bookworm from a neighboring village may happen upon it. Maybe, before you were transformed into a butter knife, you were an amazing chef in the kitchen or, perhaps, you were the head waiter in the whole castle. Backstory is entirely up to you, however, we suggest you come up with a cool accent and few extra quirks to really bring the character to life. Maybe you aren't exactly going for a PG look this Halloween, well then all you need to do is add a little bit of color to your blade. We were thinking a nice dark shade of red. You could look like a bloodstained murder weapon used in one of the most graphic and horrific acts of homicide since Jason or Michael's last killing spree. Again, backstory is completely up to you, just don't give up too many details unless you want to be charged with accessory to a murder. Whichever route you decide to take with this costume, once you slip it on you'll be the sharpest dressed person in the whole party!... The costume itself isn't actually all that sharp, so no need to worry about slicing anyone up on the dancefloor!